The 10 Best Bagel Shops in Wisconsin! Wisconsin’s many delicious bagel shops are the perfect place to satisfy that carb craving. With the state’s vast selection, you’ll try bagels you didn’t even know existed! If you’re looking for something heartier, many of these bagel shops offer bagel sandwich options as well. Whatever your preference may be, you won’t want to miss these 10 superb bagel shops in Wisconsin. Catch New York-style bagels right in Madison, Wisconsin. Bagels Forever is a state wide famous name and in all the local grocery stores. You can head into their store on University Avenue and pick from breakfast sandwiches, lunch sandwiches, and a simple bagel and cream cheese. Taste the difference of all natural ingredients. The Bagelmeister located in Fond Du Lac offers homemade bagels and schmears daily. Their famous party platters and local delivery right to your door are perfect for planning events or for breakfasts after a big sleepover. Locals love The Bagelmeister’s Brown Bag Lunch option. Gotham Bagels features hand rolled bagels and artisanal cream cheeses off Mifflin Street in downtown Madison. Bagels are all natural and have no added preservatives, using premium ingredients every time. Taste the difference between your favorite bagel chain and Gotham’s Bagels. Bagelicous offers its patrons a cool sit down bagel join, catering and delivery options, advance ordering, and of course some of the best bagels in town. They have 20 tasty bagel flavors and nine cream cheese spreads—so many options. Delicious? You mean Bagelicious! 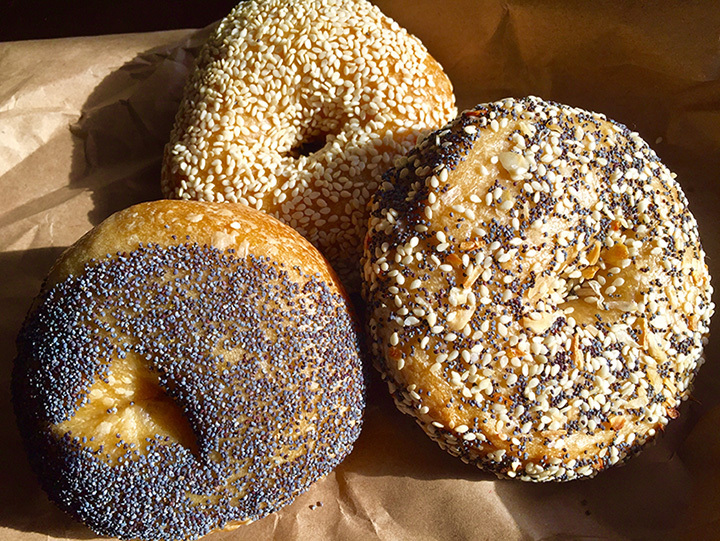 Check out Bagels and More’s baked fresh bagel selection made from scratch. Choose from plain, onion, sesame, whole wheat, everything, cinnamon raisin, asiago, blueberry, tomato herb and more. Buy a single bagel or stock up for the whole office with their 24 bagel and two-pound cream cheese option! Lox, Stock ‘N Bagel menu items are made from scratch. Choose from single bagels and cheese spreads to hearty breakfast bagels. Lunch sandwiches are served on their tasty bagels as well. Check out Green Bay’s favorite bagel joint for breakfast, lunch, or an early dinner snack before they close at 4:30 p.m. weekdays. Hudson Bagel is the perfect place to cozy up offering baked goods, a fire place, soups, and more. Their 18 variations of homemade bagels are hit in the Hudson and surrounding areas. Pair each perfectly with house-blended cream cheese flavors. Up the ante with their expanded menu options—perfect for anytime. Choose from either a hot or cold breakfast and lunch sandwiches served on a number of different bagel options. Dave’s Bagel and Bread Café located in Cedarburg offers 17 different, made from scratch bagel flavors and another 11 spreads to pair with them. Located in the Northwoods of Wisconsin in Woodruff lies the little wood cabin of Schroeter’s Bakery and Sandwich Shoppe. They offer all types of hot breakfast sandwiches served on bagels or other breads. Grab one of their famous doughnuts while you’re in too! Jersey Bagel’s inviting atmosphere with a fun shop, free Wi-Fi, and delicious trendy bagel options offers a perfect meeting place. Every month features a new bagel and cream cheese pairing to keep things fresh and up to date. Jersey has single bagel options or super bagel options piled with tons of great ingredients and flavors—they will easily become one of your favorite snack.